Present Company - The Chip's Challenge Wiki - The Chip's Challenge Database that anyone can edit! Flippers let you swim. Fire boots let you walk through fire. Watch out for moving objects. 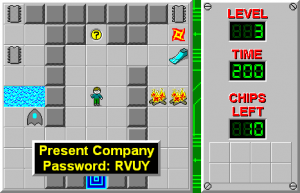 Present Company is the 3rd level in Chip's Challenge Level Pack 1, and the third of the lesson levels. It teaches the player about the remaining two boots not seen in the previous level - flippers and fire boots, and how the player can use them to cross water and fire. It also teaches the player about monsters; specifically gliders and fireballs and how they can pass through water and fire, respectively. From the start, head to the bottom area and collect the fire boots, then wait for one move, or , for the glider to pass by so that you can return without getting hit. If you find the timing of the wait difficult, try bumping into a wall before entering the area and you can sneak past the glider without losing any time. 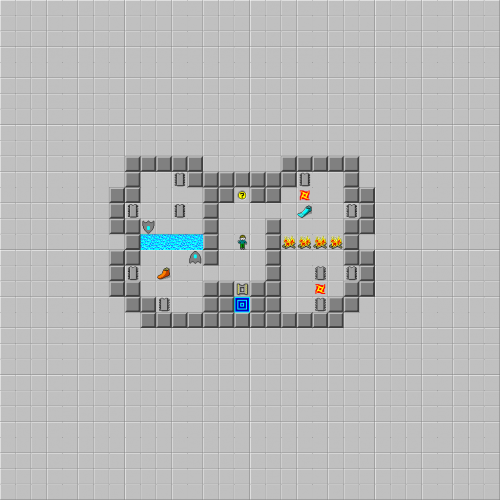 Now that you have the fire boots, walk up to the upper entrance and collect the flippers, then collect the chips in this room going clockwise, making sure to wait  for the fireball upon collecting the second chip. Return to the glider room and collect the chips there going counterclockwise, starting from the chip in the top center. Another  wait is required for a glider, this time upon collecting the fourth chip in this room. Make your way back to the exit in the center area and you should finish with a time of 183. Originally, the level also introduced thieves; however, in order to create a more steady difficulty curve, the level was changed to exclude them. Thieves are not seen in CCLP1 until the ninth level, Swept Away.